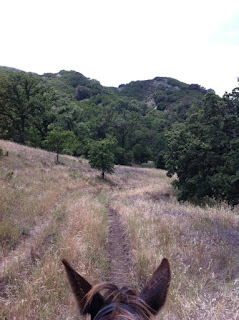 A ride from Rancho Oso on Paradise Road, crossing the Santa Ynez river several times, heading for Snyder's Trail with the goal of going to Knapp's Castle on East Caminio Cielo, in the front country range of the Los Padres Forest in Southern California. 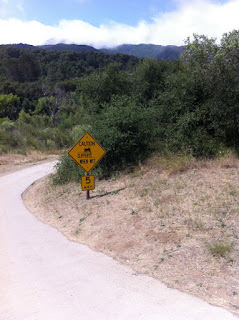 Difficulty: Mostly easy. Some areas single file, rocky track, overgrown brush. But river crossings knee-deep water and Snyder's Trail a very steep climb. 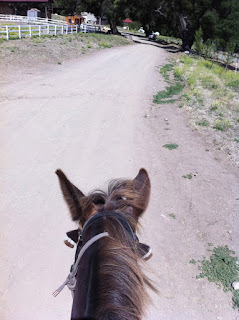 We started out at Rancho Oso, where most of the group of Sheriff's Mounted Patrol officers had stayed overnight in the little faux-town cabins next to the pole paddocks. 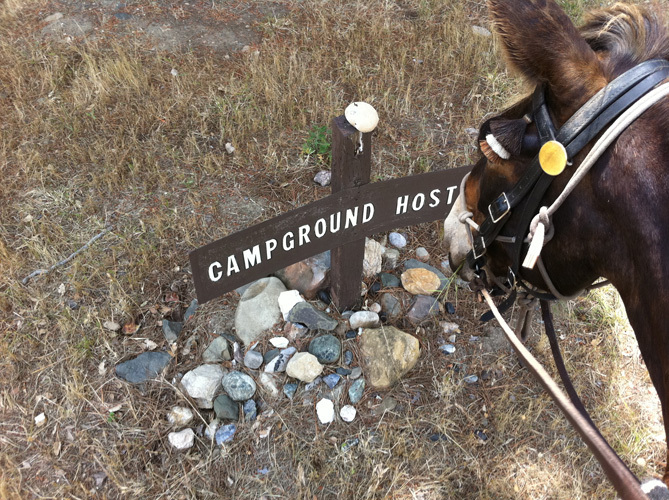 It is a perfect place for visiting equestrians to stay in either their own rigs, rental rooms in buildings, or covered wagons, with their horses in paddocks very close by. One of the women had heard about a mysterious castle, and wanted to know if we could ride to it. Certainly! We splashed across the Santa Ynez River and made our way downstream. 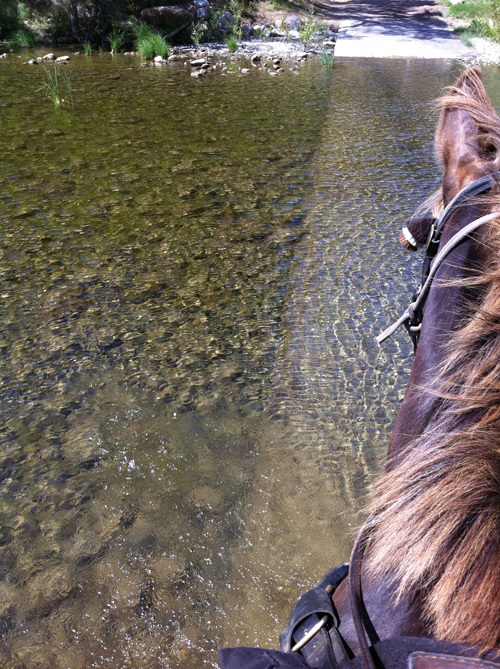 Unusual for June, the river was actually still so deep that vehicles are not being permitted across to the Lower and Upper Oso Campgrounds, making for lovely riding with few distractions. 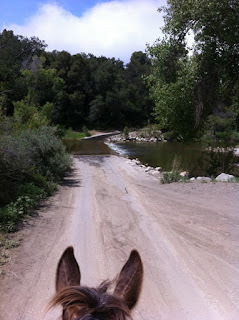 Here at the end of Paradise Road the water was easily walked through by equines. This mysterious structure would seem to be a bridge abutment, but there is nothing corresponding on the other side of the river, and in any case this is in a seldom-traveled area, not tied to any major road. 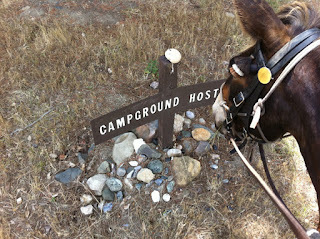 Tobe and I were mystified to find what appears to be the grave of the campground host at Sage Hill equestrian campground. This slippery when wet sign gives a very accurate representation of the spillway ahead, currently passable for vehicles, that crosses the river by the Forest Ranger District offices. The sound of the water gushing over it makes it seem more formidable than it is, all year long there is a sheet of water on it but it is not too slippery if the animals take it slowly. 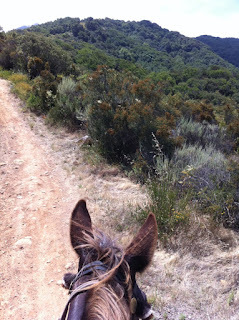 We walked through the pines on the roadside, then continued down Paradise Road a short ways, most of it with an OK off-road path on the verge. 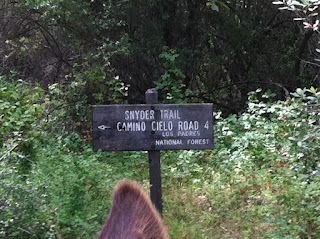 Then a dash across the road to reach the Snyder's Trail entrance. Most equestrians have given up on this trail because of the offroad bicyclists who hurtle down it at breakneck speeds. 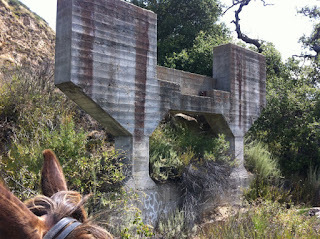 But I had a special request to go to the Castle, so I didn't think we should be scared off. 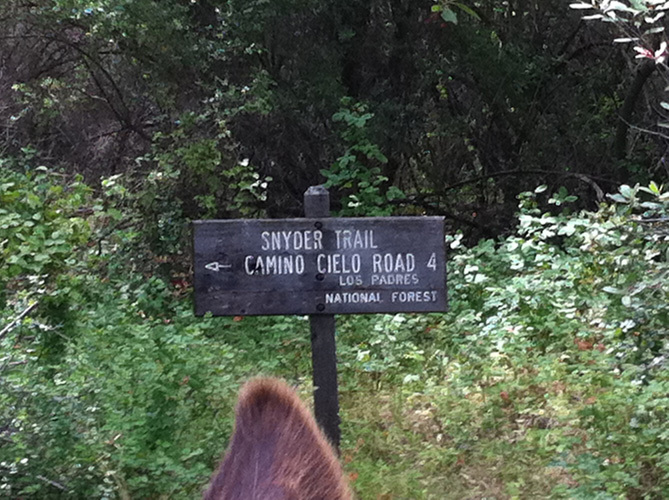 The track rises up dramatically and begins the steep ascent to Camino Cielo at the top, where Knapp's Castle is located. 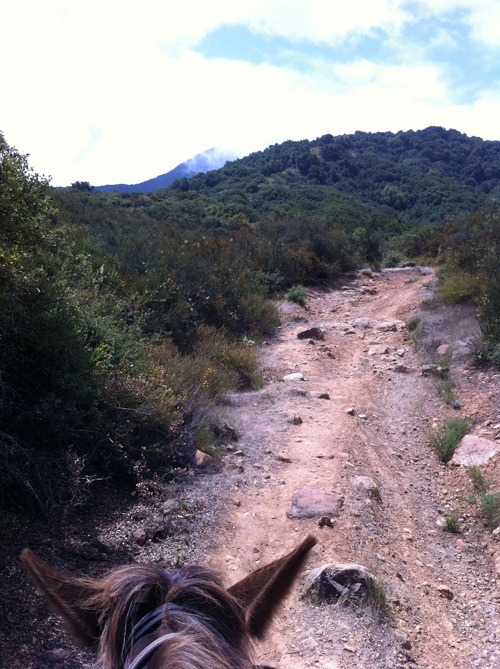 In this view it is cloaked in the maritime fog that is currently filling the canyons on the other side leading down to the sea. The chaparral was in lovely bloom and the steep track was no problem for the mule. But some of the horse riders called it quits when we were barely 10% of the way up the hill. 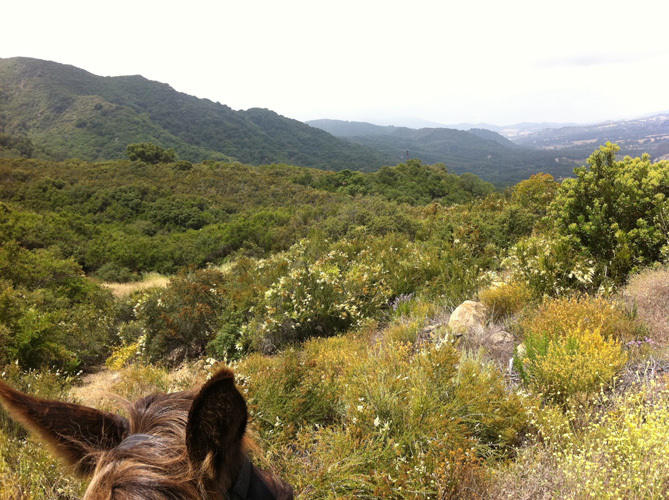 We were just starting to be able to see Lake Cachuma off in the hazy distance, and nowhere near the Castle, but they thought that it was too strenuous for their horses. 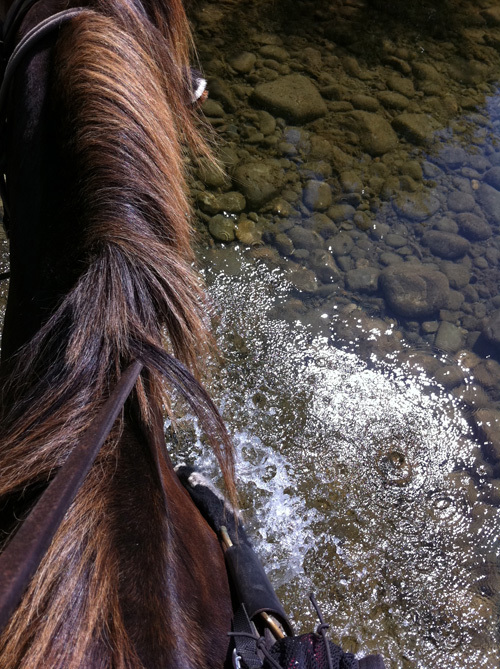 So we turned around and back-tracked. 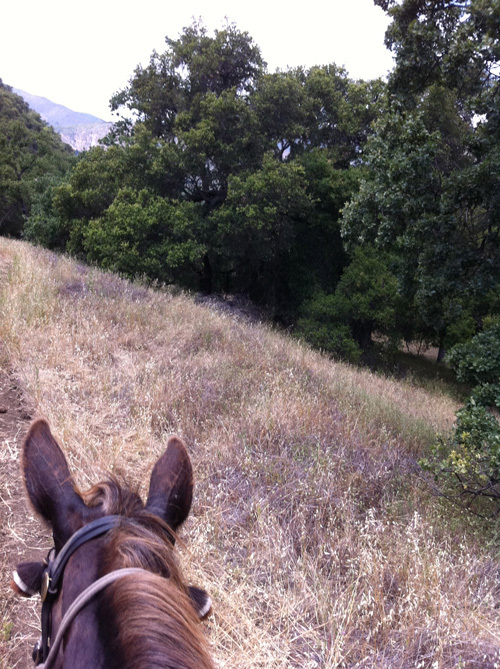 Once back at Oso the people who thought their horses were too tired out went back to the campground, and four of us did a big loop around Rancho Oso on relatively flat ground. 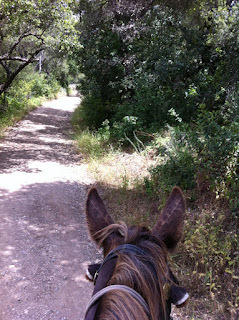 The trails are a mixture of access roads and single track, and many are shady and cool on a hot day. We finished out the day with a nice tour of the back of Rancho Oso, looping around Arroyo Burro Road to the Arroyo Burro trail, then back to the campground so the visitors could pack up and leave for home. Conquering the quest for Knapp's Castle will have to be left for another day.